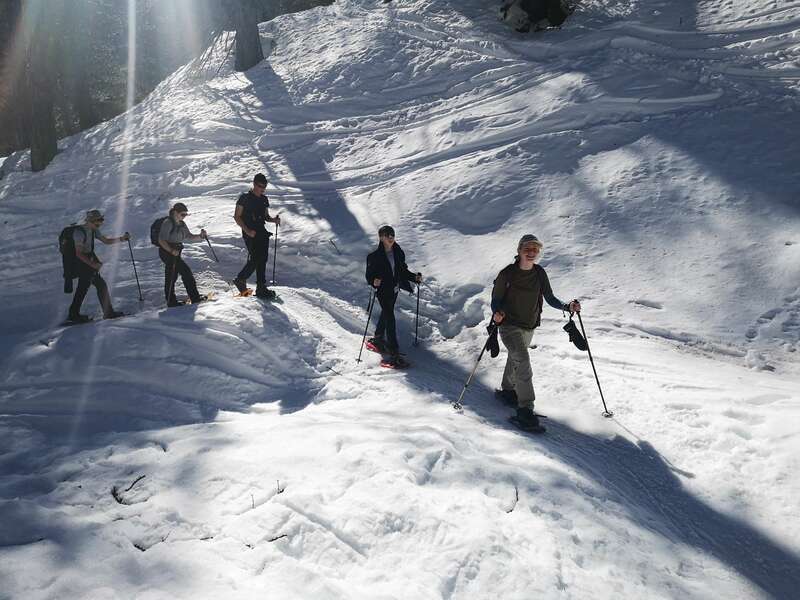 On February 17th Matravers CCF set off for the Alpes Martime in the Mercantour National Park, France. Eager and keen, our transport to London Heathrow was a lot easier than we expected. Our flights were on time and we landed in Nice airport at 20:20, greeted by our provider Mel and met with a humid evening near the Mediterranean. From here we were transported to our accommodation Gite La Zourciere, situated in the Vesubie Valley. Arriving at 21:45 we had food waiting for us, where we quickly settled in and got a good night’s sleep. Following a good rest, we enjoyed an amazing breakfast to prepare us for the day and setting an incredible precedent for the week. The team received instruction on the use of their snowshoes and transceivers before busing off to our first location, to get some practice in ready for a big week. The conditions were amazing, we had plenty of snow and the warmth of the sun. 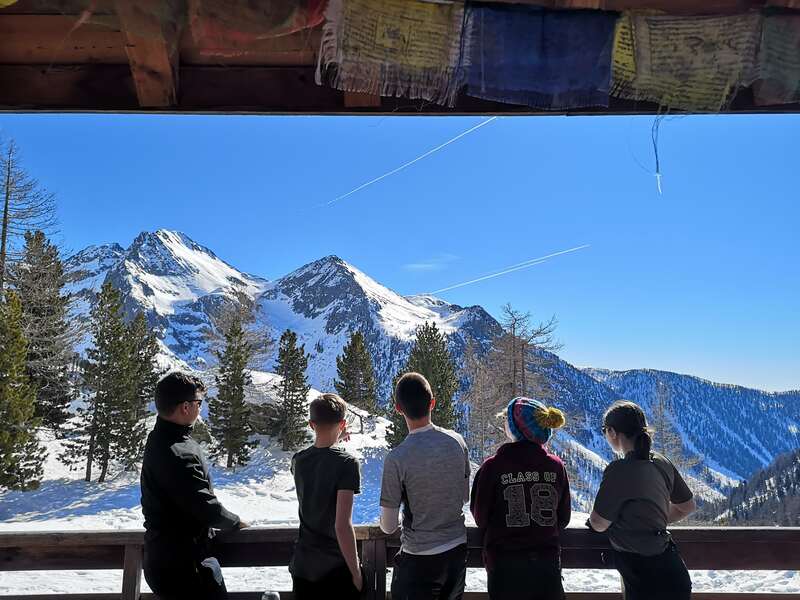 Even though it was day one, we could see our goals for this expedition were being fulfilled, as the cadets were mesmerized by the alpine environment and the volume of snow on the mountains. After journeying and ascending into the valley, we cleared away a place for lunch. The scenery was beyond imagination, our cadets horizons were expanding and they were loving each moment in the mountains. It prompted discussion around career opportunities in France, talk of future holidays when they were older and quizzing our guide about how he stumbled across the Alpes Maritime. Following lunch, the cadets were given an avalanche scenario, split into two groups, casualties and searchers. The difficulty of the terrain and the snowy environment tested the cadets’ ability to travel quickly but also use the appropriate searching techniques to find the casualties within a 5 minute window. Following our training, we made our way back down the mountain side for a debrief, our dinner and time some evening revision! 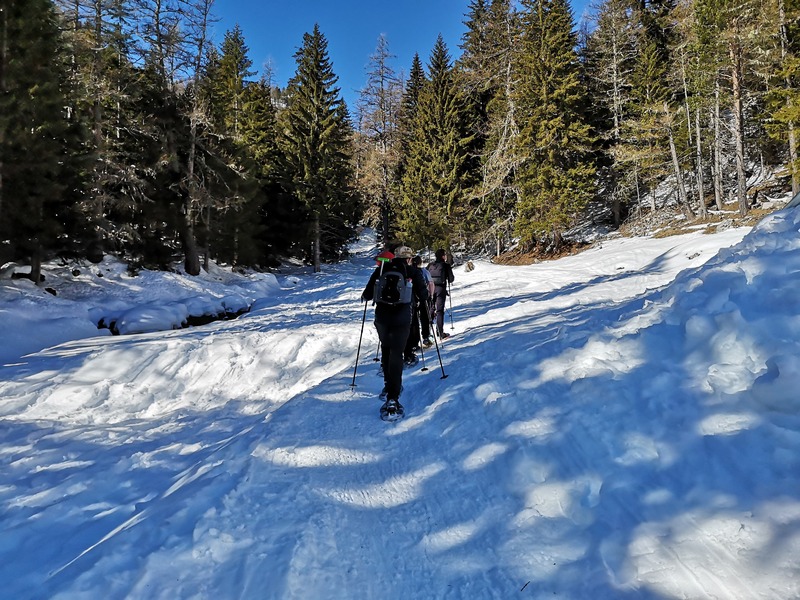 Our second day was our best day, as a team we were now comfortable with snowshoes having undertaken our avalanche awareness training setting out with comfort about the expectations ahead. The terrain was perfect but also testing as the cadets completed a 15km day in an undulating environment. We set off from Le Boreon to Refuge La Courgounde, ascending 700m moving through farmland, pastures and woodland. We stopped for lunch at the refuge, which were surprised to find open before returning to Le Boreon after a tiring day. Day 3 saw us take a break from snowshoeing and explore the medieval village of Utelle, this day actually turned into a summer hill walking day where the cadets explored the ecology and history of the area. As this had not been anticipated as such a challenging day, the cadets were more fatigued than we had initially planned. During day 4 the cadets quite exhausted from previous days, therefore we had to take the decision to provide them a rest to ensure another quality snowshoeing day could be achieved. Day 5 we undertook our final snowshoe before returning home. We set off from Le Boreon once again travelling through the valley toward Lac de Cerise. Making good progress throughout the day, we stopped for a snow skills lesson. 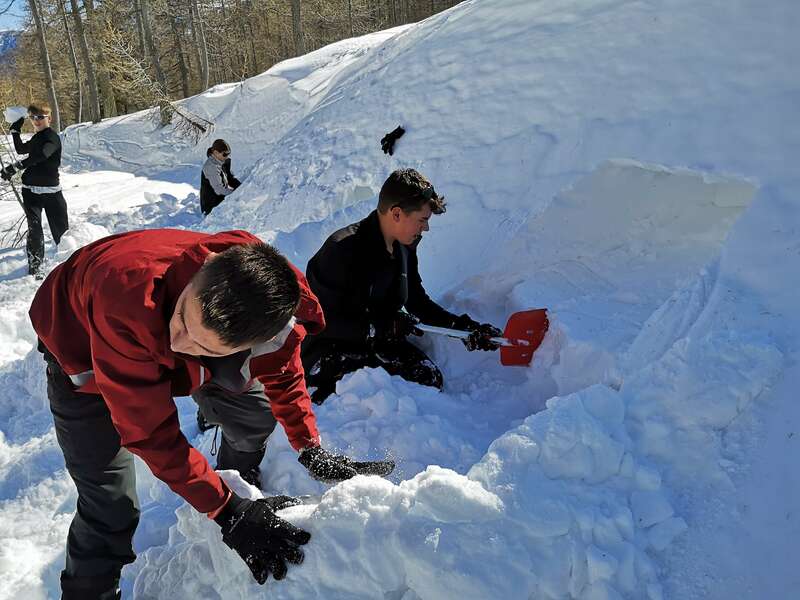 Where our guide taught the cadets how to build a snowhole, the cadets worked really hard at this and built some very credible shelters that any mountain leader would be proud of! Their effort spent, we made our way gradually back down to pack up and prepare for home the following day. We safely arrived back in the UK early Saturday 23rd February, very quickly experiencing expedition blues but feeling that our planned outcomes had been achieved! The cadets had enjoyed a world class experience, learning about the sensitivity of eco systems and the alpine environment. This has truly supported the development of Matravers CCF a new Cadet Expansion programme school and demonstrated that this initiative is truly making a difference to the lives of young people from all backgrounds. We thank the Ulysses trust for their generous support in making this expedition possible.